The myth of the indigenous Australian as a hunter-gatherer living off the gleanings of boomerang and spear is alive and well in the 21st Century in Australia. 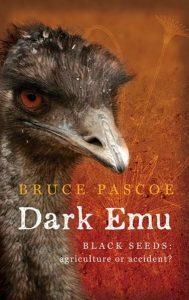 The book Dark Emu presents compelling evidence that Aboriginal people did build houses, did build dams, did sow, irrigate and till the land. The British perceptions of an untamed, untilled land with no husbandry is plainly untrue. So also is the perception that Aboriginals were not farmers.